The Provincial Cancer Care Program would like to inform physicians that you can refer a patient to a Cancer Patient Navigator if there is suspicion of cancer. Patients do not need a cancer diagnosis to be assisted with navigation of the cancer care system. Patient and family feedback indicates that the most stressful and challenging time in a cancer journey is navigating the system prior to a cancer diagnosis. Cancer Patient Navigators are available to help patients, their families, health care providers and doctors. They can answer questions about treatment and follow-up care. They can also help with emotional, spiritual, financial, transportation and other practical matters. Any health professional can refer a patient to the Cancer Patient Navigator. Patients and family can also contact the Navigator directly by calling (toll free) 1-855-848-3888. To request hard copies of the poster or brochure please call (709) 777-6980. 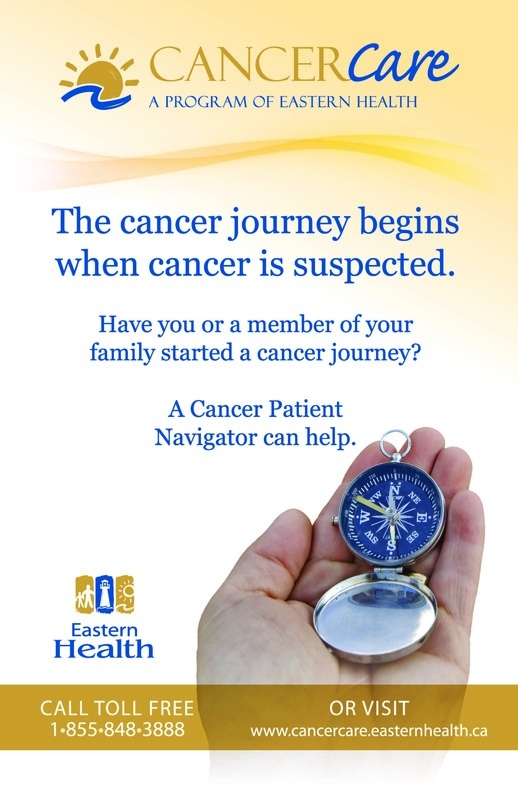 For more information visit www.easternhealth.ca/CancerCare.